Many talented digital scrapbooking fanatics are wanting to work from home and get paid with their hobby. It is a good time to consider starting a business in which you can work from home in the digital scrapbooking field, due to the growth taking place in this industry.Starting a digital scrapbooking business may not be as hard as you think. For those who don’t feel they are expert enough yet, keep on studying the online tutorials and lessons that are available. You’ll get better as you keep working on your skills. The main thing anyone needs to start a business is a passion – the skills can be gained, but passion is not something that can be learned. Also, for any home business, there are things to learn about running a business, keeping track of financial accounts and budgeting. You also would need to be sure you have an up-to-date computer (PC or MAC is fine), and a high speed internet connection. Next on the list of things to do to prepare for a home business as a scrapbook designer would be to decide if you will try to work for individuals you know or if you would like to try to find customers through the internet. For marketing yourself, you could look for clients locally, through schools, churches and other people you know. Making flyers, having a business card and coming up with a name for your business would be some of the first steps to take. With the lower cost of internet websites and hosting, many digital scrapbook artists have websites. If you aren’t knowledgeable about creating a website, you can find many graphic designers and web designers who can help you get a website started – and it doesn’t have to cost a fortune. The newest trend in websites is with the use of content management platforms, such as WordPress. What is so great about these blog formats is that anyone can post information in them (no dependency on a web developer is needed). Again, you may need a web designer to help get your blog set up with customized banner artwork that uses your company logo. After a blog (such as a WordPress blog) is created, the tools that are built in to write posts and upload or insert pictures is very easy to learn. So, consider starting your own business – what can it hurt? If you want to buy a domain name, these days it only costs about 9 dollars a year. Hosting can cost as little as 5 dollars a month. Other options are to join some of the sites that offer a website where you can sell your products, such as digital scrapbook kits. Some of the sites I have seen for this are Etsy or Plumbdrop. These sites are growing quickly and many people who used to use Ebay to sell their products have branched out to other selling sites like these. Basically, just don’t limit yourself. If you have a dream, pursue it! You really can do so much today with very little monetary investment. Mostly your time and interest will be what is needed to get started, keep going and to eventually make a digital scrapbooking business. Adobe has finally figured out that many scrapbooking fanatics are using their software. You should go see how the site has changed (to include tips and help for scrapbookers). Photoshop Elements 7 costs $99.99 or Photoshop Elements 7 with Photoshop.com Plus membership for $139.99. For Mac – Photoshop Elements 6 is on sale. It’s their Dad’s and Grads sale – $89.99 for the full version or $69.99 for the upgrade. These discounts never last for long, so act fast if buying Adobe Photoshop Elements was on your “to-do” list! 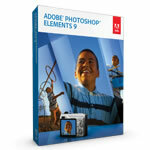 What is the Adobe Photoshop Elements 7 with Photoshop.com Plus* membership? So, for a little more money you get a lot more with storage space, tutorials, templates and photo-shareing tools.